FOUR WALLS/FUNKYJAWS One Night In Grodno vinyl at Juno Records. 2. 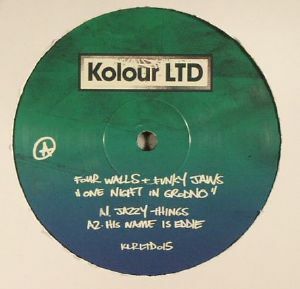 "His Name Is Eddie"
The vinyl only Kolour Ltd operation dip their toes in the rich pool of house music talent currently bubbling away in Russia, welcoming Grodno based pair Four Walls & Funkyjaws into the fold on their first 12" of 2014. Four tracks deep, One Night In Grodno demonstrates this pair have a firm and diverse production grasp of what's classified as underground deep house. Check the mad sax solo that breaks free on opening cut "Jazzy Things" Listen on "His Name Is Fast Eddie" reveals Four Walls and Funkyjaws find it difficult not to let their musical side take hold, though the understated diva flex of "Love Train" might be the best cut here.